Scooter by the Sea: ...and I didn't look back! ...and I didn't look back! To keep this a family-friendly scooter blog, I ask readers to read between the lines in the account below. I think the male scooterists will understand right away, for surely we've all had our manhood questioned as we ride scooters on roads dominated by big bikes. ...but a Harley much like it that approached on my right as I waited for a notoriously long red light to change to green. Astride the big bike was a large, scruffy, big-bellied man wearing shorts and a faded T-shirt that barely covered his bulging gut. Stopping his loutishly loud Hog next to me, he glared with disdain at my neat, clean, quietly purring Vespa GTS 250. First, he sneered with disgust as he pointed at my Vespa, then turned up his mouth in a nearly toothless grin, and laughed hard, lifting his fat, bearded face toward heaven, and shook his head so hard that the hankie covering his huge bald skull fell off. "Wouldn't you really rather have one of these?" Here's the layout of the encounter, with my escape route indicated by the arrow. "No." I replied truthfully, after the din died down. "I am a more than adequately equipped man. I have no need to compensate mechanically." You get the idea. Using my cruder words, hankie-headed Harley man understood. 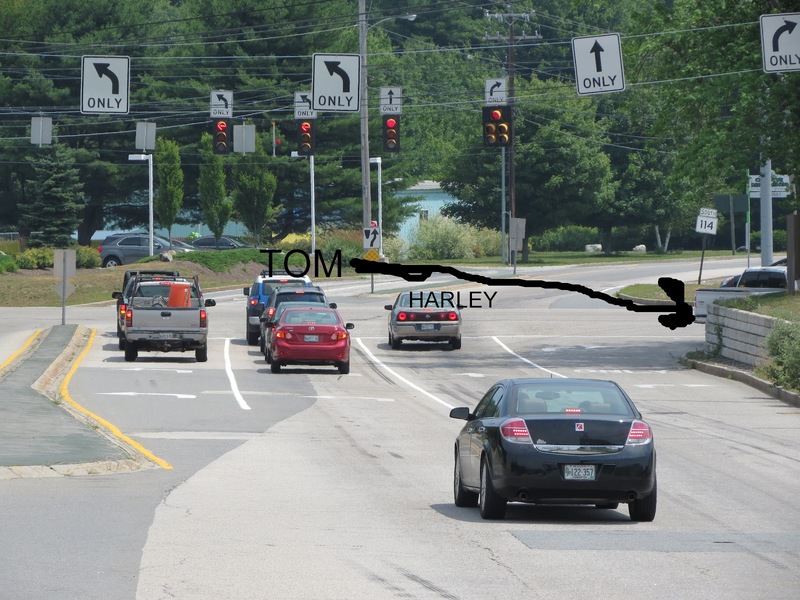 Follow the arrow - I made an illegal right turn against a red light to escape the now red-faced, roaring blimp-on-a-bike. Doubling the 25 mph speed limit, I didn't look back. "Elderly Scooter Rider Beheaded By Furious Harley Biker"
Ts, ts. 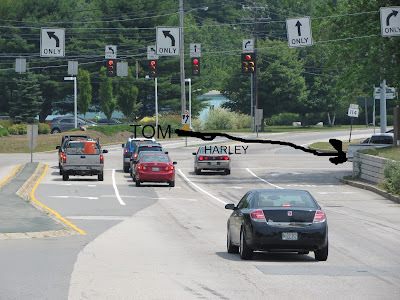 Tom, you better shouldn't provoke big bellied men on their chrome blinking two wheels by insinuating they might have small wieners, or you might end up in the ditch one day. It is one thing for a guy to say that, another when a girl is suggesting it (he he). I know I took a chance there - that's why I ran like a little kid! But sometimes, one is pushed too far, and the "Popeye" instinct takes over - "That all I can stand - I can't stand no more..."
At least you know you could out run him and out man him. We say the same thing when we see guys in jacked up pick-up trucks. The bigger the truck the more likely they are to be compensating. Just feel sorry for his wife and/or girlfriend, lol. Well, I definitely outran him. 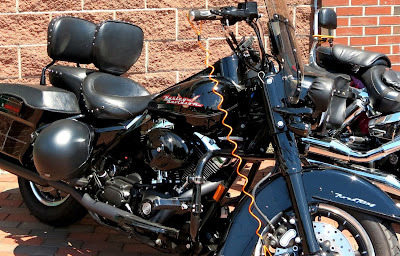 I certainly do not want to disparage all Harley riders, for I know some great people who own them. But I haven't had any negative encounters with Honda, Triumph, Yamaha, etc. riders. I think it's the noise that they insist on making that has rattled the brains of the mean and nasty few - and those are the ones we hear about. Awesome move! And damn funny! You did good. Now let's hope he doesn't come back looking for you. Squirt gun sidearm. GTS's are mighty quick and nimble. I doubt he could have caught you had he tried. The truth is that he probably couldn't hear what you said. Those loud pipes may have saved his life a time or two, but more likely they've completely destroyed his hearing. I was on an expressway on my smaller LX earlier this year. A similar fellow pulled up next to me in the rush hour traffic and said "hey, you're not allowed here on that!". I popped by helmet open, said he was wrong and I was very much allowed. Momentarily distracted, he didn't notice the traffic had freed up. I scooted into a gap and was gone. It took him a good five miles to pass me. I was doing about 60-62 mph, he may have been going 65-66 mph. I got a kind of sixth sense that he learned something that day about Vespas. It seems that our Vespas have taught a pair of Big Bikes Only gents a lesson. Good for us! My hankie-headed pal most definitely heard every word I said, for my voice was raised to a level I rarely need, and I enunciated like a Shakespearian actor. Knowing I would never have a another opportunity like this, I was loud and clear. Too funny! Actually able to say something so many of us wish we had the cajones to. Even on a straight away you would have been able to get away. You hall hiney on your steed!! And he probably wouldn't have the guts to go as fast as you. And good for you enunciating. :^ D If nothing else- "Read my lips" buddy! Didn't your parents teach you to not tease dogs? Indeed, I respect the danger teasing dogs entails, but in this case, the incessant barking required a calculated risk. I've not intentionally provoked rhinos though I have poked at my friends.